Text Book: An Introduction to Mathematical Reasoning, Cambridge Univ. Press, by P. Eccles. Recommended Book: What is Mathematics?, Oxford Univ. Press, by Richard Courant and Herbert Robbins. This book is available via Amazon. Recommended Reading: Logicomix, Bloomsbury Press, by Apostolos Doxiadis and Christos H. Papadimitriou. This book is available via Amazon. 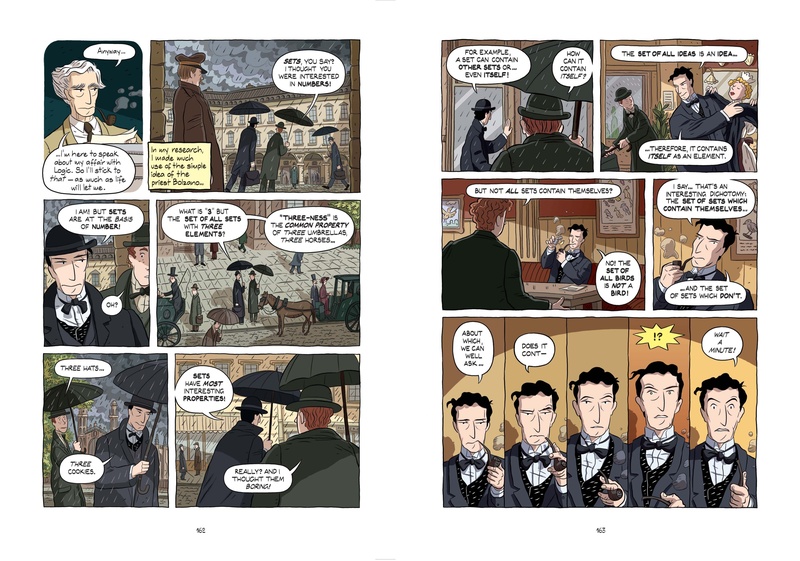 Logicomix is a graphic novel about the search for foundations of mathematics at the hands of Bertrand Russell, Gotlob Frege, David Hilbert, Kurt Goedel, Ludwig Wittgenstein and others, set in the context of a political lecture by Bertrand Russell at the beginning of World War II. Recommended Reading: The No Sided Professor. This is a topological short story by Martin Gardner. Recommended Reading: The Feeling of Power. This is a short story by Isaac Asimov. Recommended Reading: InfiniteHotel. A cartoon story about an infinite hotel that can seemingly accomodate any new influx of guests. Recommended Reading: Math SciFi. "And He Built a Crooked House", by Robert Heinlein. Class Meetings : 2PM to 2:50PM, 316TH, MWF. Office Hours: 3PM to 4PM on MWF. Prereqisites: Grade of C or better in MATH 181 and approval of the department. Description: This is a first course in theoretical mathematics. It is a prerequisite to all advanced theoretical courses in the department. The primary goal of the course is to learn how to create and write mathematical proofs. We will introduce basic proof techniques, such as proofs by induction and contradiction and the course will cover symbolic logic, basic set theory and some selected topics in combinatorics, geometry, topology and number theory. As time permits, we will cover most of Parts I-III and parts of Part V of the text. The course will proceed via projects and problems. We will begin by using the text by Eccles to work on basics of logic, sets, proof by induction and problems involving sets and arithmetic. Because the course is structured through evolving problem sets and projects, it is essential that you WORK ON THE PROBLEMS AND ATTEND ALL THE CLASSES. There is no recourse here to staying away from class. If you miss a class, please see the instructor and get a recapitulation of what went on in that class. Credit in the course will be a function of your homework, projects and the exams. See ASSIGNMENT1 Here is the first assignment. It is due on Friday, January 25, 2013. See Four Knights Here is a Java Applet that will help in working on the first problem in Assignment Number One. See Geometry. A short article about plane geometry, the pentagon and the golden ratio. This will help in working on the last problem in Assignment Number One. See Konigsburg. Here are notes about Euler, the Konigsburg Bridges, Mathematical Induction and a proof of the Pythagorean Theorem. See ShiftyCard. This is a cut-out puzzle. Arrange one way and you count 12 cards. Arrange another way and you count 13 cards. What is going on? See The Game of Logic. This is a scan of the book "The Game of Logic" by Lewis Carroll (author of "Alice and Wonderland" and "Through the Looking Glass") published in 1886. It is a brilliant introduction to the logic of syllogisms, using a diagrammatic method invented by Carroll. We can use Carroll's methods on the Venn diagrams that are part of this course. 'Lewis Carroll' is the pen-name of the Reverend Charles Dodgson. He was a lecturer at Oxford University in Great Britain and a precursor,in his work, to the modern formulations of logic and Boolean algebra that we are studying. If you read 'The Game of Logic', take note that when WE say "All A are B." we allow for its truth when no A exist. For Carroll, the statement "All A are B." entails the existence of some A. See ASSIGNMENT2 Here is the second assignment. It is due on Monday, February 4, 2013. See ASSIGNMENT3 Here is the third assignment. It is due on Wednesday, February 13, 2013. The notes for this assignment also contain information about graphs and about the Euler formula for planar graphs. We will use these in class discussion and for a problem in the next assignment. See ASSIGNMENT4 Here is the fourth assignment. It is due on Wednesday, February 27, 2013. Along with the problems in the set above, please add the Lewis Carroll logic problems numbers 54 and 60 in Carroll. You can solve these using Venn diagrams, by first translating them into symbolic logic or set logic as we have done in class. The First Exam is at class time on Wednesday, March 6, 2013. See SAMPLE EXAM This is a sample first exam. See SAMPLE EXAM This is a sample second exam. It will be clear to you that some of the problems on this second exam are possible for our first exam. Specifically, problems 1,2,3,4,7 and 8 are all possible for our first exam! See ASSIGNMENT5 Here is the fifth assignment. It is due on Wednesday, March 20, 2013. See ASSIGNMENT6 Here is the sixth assignment. It is due on Friday, April 12, 2013. See ASSIGNMENT7 Here is the seventh assignment. It is due on Monday, April 29, 2013. The Second Exam is at class time on Friday, April 19, 2013. See SAMPLE EXAM This is a sample second exam. The Second Exam was at class time on Friday, April 19, 2013. We now have a Take Home Exam as part of the second exam. See Take Home Exam. It is due on Friday, April 26,2013. Here are three extra credit problems. If you got the take home exam as a hand-out, then the extra credit problems are on the fourth page. See Extra. Here are two sample final exams. One Final. Another Final. THE FINAL EXAM IS WEDNESDAY, MAY 8, 2013 IN 316 TAFT HALL (OUR USUAL CLASSROOM) FROM 1PM TO 3PM. NOTE THE CORRECTED TIMES!!!!! RREVIEW SESSION is Monday, May 6, 2013 in 612 SEO from 3PM to 5PM. See Logicomix Here is a panel from Logicomix where Bertrand Russell discovers the paradox of the "Set of all sets that are not members of themselves.". See Peano Arithmetic for an approach to axiomatic arithmetic via the Peano axioms for the natural numbers. In these notes we use nested marks (right angle brackets) to represent natural numbers. These notes will evolve. The present version just presents the axioms and some commentary. See Cantor-Schroeder-Bernstein This is a proof of the Cantor-Schroeder-Bernstein Theorem. See Set Theory. This is a concise set of notes on basic set theory, taken from the book "Principles of Mathematical Analysis" by Walter Rudin. See Infinite Sets. These are supplementary notes on infinite sets. Below this point are links to supplementary material that we shall use during the course. See Calculus. This is a set of notes on calculus using infinitesimals. See Boolean Notation. A short article about Boolean Algebra notation. See Peano Axioms for a list of the Peano axioms for the natural numbers and a list of problems to prove, using these axioms. We will discuss the problems in class after learning more about induction. See Landau's Foundations for a working out of the Peano axioms from a classic book by Edmund Landau. Landau wrote his book in 1929 and you should read the introduction for the student to experience his very upright attitude toward learning mathematics. See Conway's Sprouts. This is an excerpt from the book "Winning Ways for Your Mathematical Plays" by Conway, Berlekamp and Guy. It contains information about the game of sprouts. See ContFrac. This is a calculator on the web that converts numbers to their continued fracations. Try it on sqrt(2), sqrt(3), e, pi and other favorite numbers. See VanPoorten. This is an excellent article on continued fractions. See Recreations. This is an access page to programs and mathematical recreations. Keep watching this webpage for problems and notes related to the course.